Ca0.20Ba0.80Nb2O6 (CBN-20) crystal has been implanted by 5MeV carbon ions with the fluence of 1 × 1015 ions/cm2. Based on the prism coupling and end face coupling measurements, the light could propagate along with ordinary light direction in the implanted sample which convinced that planar optical waveguide was formed successfully on CBN-20 crystal after C-ion implantation process. The peak position and intensity of Raman spectra have shown obvious changes between the waveguide layer and the substrate, therefore the Raman spectra can be used to visualize the damage or defects produced during the implantation process in the CBN-20 crystal. W. L. Gao, G. Q. Xie, J. Ma, P. Yuan, L. J. Qian, J. Q. Di, X. D. Xu, J. Xu, and M. A. Swirkowicz, “Self-Frequency Conversion Laser in Nd-Doped Calcium Barium Niobate Ferroelectric Crystal,” Photon. Technol. Lett. 25(15), 1405–1407 (2013). P. Haro-González, I. R. Martín, L. L. Martín, F. S. León-Luis, C. Pérez-Rodríguez, and V. Lavín, “Characterization of Er3+ and Nd3+ doped Strontium Barium Niobate glass ceramic as temperature sensors,” Opt. Mater. 33(5), 742–745 (2011). C. Shekhar Pandey, J. Schreuer, M. Burianek, and M. Muhlberg, “Relaxor behavior of ferroelectric Ca0.22Sr0.12Ba0.66Nb2O6,” Appl. Phys. Lett. 102(2), 022903 (2013). S. Ke, H. Fan, H. Huang, H. L. W. Chan, and S. Yu, “Dielectric, ferroelectric properties, and grain growth of CaxBa1-xNb2O6 ceramics with tungsten-bronzes structure,” J. Appl. Phys. 104(2), 024101 (2008). P. F. Ndione, M. Ferrera, D. Duchesne, L. Razzari, M. Gaidi, M. Chaker, and R. Morandotti, “Hybrid integration of Ca 0.28 Ba 0.72 Nb2O6 thin film electro-optic waveguides with silica/silicon substrates,” Opt. Express 17(17), 15128–15133 (2009). Y. Tan, F. Chen, D. Jaque, W.-L. Gao, H.-J. Zhang, J. G. Solé, and H.-J. Ma, “Ion-implanted optical-stripe waveguides in neodymium-doped calcium barium niobate crystals,” Opt. Lett. 34(9), 1438–1440 (2009). G. Fu, K. M. Wang, X. L. Wang, H. J. Zhang, X. G. Xu, H. L. Song, and H. J. Ma, “Planar waveguides in calcium barium niobate fabricated by MeV He ion implantation,” Appl. Phys. B 87(2), 289–292 (2007). D. Kip, S. Aulkemeyer, and P. Moretti, “Low-loss planar optical waveguides in strontium barium niobate crystals formed by ion-beam implantation,” Opt. Lett. 20(11), 1256–1258 (1995). P. D. Townsend, P. J. Chandler, and L. Zhang, Optical Effects of Ion Implantation (Cambridge University Press, 1994). 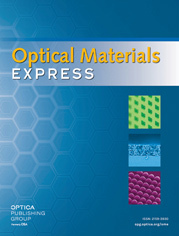 F. Chen, X.-L. Wang, and K.-M. Wang, “Development of ion-implanted optical waveguides in optical materials: A review,” Opt. Mater. 29(11), 1523–1542 (2007). I. De Wolf, “Micro-Raman spectroscopy to study local mechanical stress in silicon integrated circuits,” Semicond. Sci. Technol. 11(2), 139–154 (1996). H.-C. Huang, J. I. Dadap, O. Gaathon, I. P. Herman, R. M. Osgood, S. Bakhru, and H. Bakhru, “A micro-Raman spectroscopic investigation of He+-irradiation damage in LiNbO3,” Opt. Mater. Express 3(2), 126–142 (2013). S. M. Kostritskii and P. Moretti, “Micro-Raman study of defect structure and phonon spectrum of He-implanted LiNbO3 waveguides,” Phys. Status Solidi C 1(11), 3126–3129 (2004). A. Ródenas, A. H. Nejadmalayeri, D. Jaque, and P. Herman, “Confocal Raman imaging of optical waveguides in LiNbO3 fabricated by ultrafast high-repetition rate laser-writing,” Opt. Express 16(18), 13979–13989 (2008). J.-H. Zhao, X.-L. Wang, and F. Chen, “1/4-Branch waveguide power splitters in lithium niobate by means of multi-energy O ion implantation,” Opt. Mater. 32(11), 1441–1445 (2010). H. Hu, F. Lu, F. Chen, B. R. Shi, K. M. Wang, and D. Y. Shen, “Extraordinary refractive-index increase in lithium niobate caused by low-dose ion implantation,” Appl. Opt. 40(22), 3759–3761 (2001). J. F. Ziegler, computer code, SRIM, http://www.srim.org . P. J. Chandler and F. L. Lama, “A new approach to the determination of planar waveguide profiles by means of a non-stationary mode index calculation,” Opt. Acta (Lond.) 33(2), 127–143 (1986). L. Wang, F. Chen, X. L. Wang, L. L. Wang, K. M. Wang, L. Gao, H. J. Ma, and R. Nie, “Si2+ ion implanted into stoichiometric lithium niobate crystals: Waveguide characterization and lattice disorder analysis,” Nucl. Instrum. Meth. B 251(1), 104–108 (2006). Rsoft Design Group, Computer software BeamPROP version 8.0, http://www.rsoftdesign.com . J. H. Zhao, X. F. Qin, F. X. Wang, G. Fu, H. L. Wang, and X. L. Wang, “Optical planar waveguide in sodium-doped calcium barium niobate crystals by carbon ion implantation,” Nucl. Instrum. Meth. B 307, 452–455 (2013). H. C. Huang, J. I. Dadap, I. P. Herman, H. Bakhru, and R. M. Osgood, “Micro-Raman spectroscopic visualization of lattice vibrations and strain in He+- implanted single-crystal LiNbO3,” Opt. Mater. Express 4(2), 338–345 (2014). Fig. 1 The effective refractive index (neff) versus mode number of the CBN-20 planar waveguide for no and ne: (a) at a wavelength of 633 nm, (b) at a wavelength of 1539 nm. Fig. 2 Microscope picture of the end face of the CBN-20 after 5 MeV C ions implantation. Fig. 3 Electronic (divided by 10) and nuclear energy losses as a function of the penetration depth for 5 MeV C ions implanted into CBN-20 based on the SRIM 2010 simulation. Fig. 4 The no (dashed blue line) and ne (solid red line) profile of the C ions implanted planar waveguide with energy of 5 MeV and fluence of 1 × 1015 ions/cm2: (a) at a wavelength of 633 nm; (b) at a wavelength of 1539 nm. Fig. 5 The near field light intensity profile of the planar waveguide: (a) TM0 mode captured by a CCD camera correspond to no direction; (b) simulated result of TM0 mode based on no profile; (c) simulated result of TE0 mode based on ne profile. Fig. 6 Raman spectra obtained at end face of the sample with different probing locations: waveguide region labeled by solid red line, substrate region labeled by dashed blue line. (b) is normalized Raman spectra by use of (a).